Here are a few tips on getting started with CyberLink PowerDirector (PDR) 12. I use PDR to produce all my videos, including the ham radio training videos and the occasional travel video. Open CyberLink PowerDirector 12 by clicking on its icon or by selecting it via the Start Menu. I find it easiest to simply select and then delete the sample clips. They get in the way. Note that there’s a place in Preferences that you can select that will suppress them when PDR loads (discussed below). This brings up a screen with many preferences. These are the items you can change on the Preferences page. General. You can leave everything at default. Capture. You can leave everything at default. Confirmation. You can check everything except be sure that “Enable file deletion from hard drive” is unchecked. Otherwise, when you delete a clip from the PDR library, it could be deleted from the hard drive and you will lose it forever. 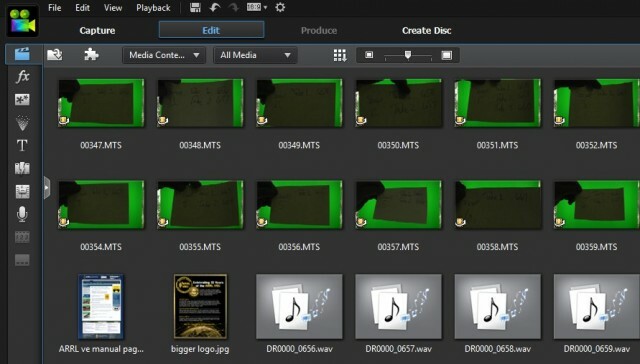 You should save deleting unwanted clips from the hard drive as a task to be done outside of PDR. Director Zone. Whether you sign up to be a member of Director Zone (CyberLink’s web page for people to share effects and videos) is up to you. I am a member. Leave everything at default. Editing. Okay, we can make some changes here. You probably want to set the default transition behavior to Overlap. And you want the default workspace to be Timeline. I personally like to uncheck “Add an effect and a title when using Freeze Frame” because it’s easier to add my own. Freeze frame allows you to select a frame in a video clip, turn it into a still image, and insert it right back into the middle of the clip. For example, if you want to freeze the motion on a golf swing, you can do that. You can even edit the still image to include arrows and text, or edit it with your favorite image editor. I unclick “Switch to movie mode automatically during playback” because most of the time I want it to be in clip mode, meaning working with an individual clip, rather than the whole movie. Select “Enable snaps to clips in timeline” (default) because it makes it very easy to line up clips perfectly. Regarding the durations, I personally prefer image files to last 5.0 seconds, titles to last 5.0 seconds, transitions to last 0.7 seconds (I like fairly snappy transitions), and the rest at default. File. Okay, here’s where we do the real work. You should do this prior to every project you undertake, even before you open the first video clip. For the import folder, click on Browse and navigate to the folder with all your video clips for your project. For the export folder, click on Browse and navigate to the same folder so that your rendered (produced) video goes to the same project file. NOTE that this setting does not change when you change to a new project, so you need to reset this for every project. Nor does PDR save this setting with the project file. I’ve asked CyberLink to change this (I’m one of their MVPs) but don’t think this will happen any earlier than the next full version. For the Production file prefix, change this to what you want for your project, for example “Rocky Mountain Vacation Video.” The produced file will appear in the export folder. The rest of the settings you can leave at default or modify if you want. Display. You can leave these at default if you like. I chose to select “Snap to reference lines” and “TV safe zone.” The latter puts a dotted line inside the video area that’s called the “TV safe zone,” meaning all TVs will display at least this much of the picture. If you put titles outside this area, you risk having them cut off when displayed on a television set. Hardware Acceleration. The options here depend on your computer’s hardware configuration. Check those things that work for you. Note that OpenCL is different from OpenGL. By all means check OpenCL. Selecting the wrong options can cause PDR to crash during rendering, so if you run into stability problems, experiment with the settings here. Project. The “number of recently used projects” is the number of projects to list when you select File > Recent Files. I’ve set this to 10. 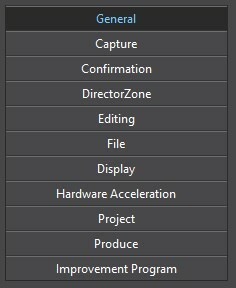 I’ve unchecked “Automatically load the last project when PowerDirector opens.” I’ve also unchecked “Automatically load sample clips when PowerDirector opens” because I never use them for anything. VERY IMPORTANT: Make sure “Auto save project every” is checked! And put a number in here that’s reasonable, probably no more than ten minutes. I have mine set to five minutes. The path listed below that is where the auto-saved projects are stored. Make sure you know where this is (write it down for future reference), or perhaps reset it to somewhere a bit more accessible. It’s no fun to spend a couple hours on a project and then have the computer crash before you’ve saved your work. You can go find the autosaved file and pick up where you left off. Produce. You can leave these at default. Improvement Program. Personally, I like to participate, because it means that CyberLink learns how I use PDR. CyberLink also gets notice of crashes. When this is averaged over thousands of users, this helps CyberLink improve the product. Whether you check this is up to you. Okay, now you’re ready to import some video clips. Please note that merely having a clip on your hard drive does not mean it will automatically show up here in the “library.” To add clips to the library (the space in PDR where you can see the clips), click on the folder icon. This allows you to import a single clip or an entire folder. 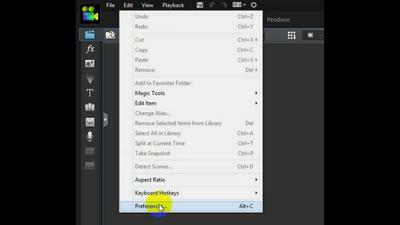 You import clips into PDR’s “library” by clicking on the icon shown. Here’s what I get when I “Import a Media Folder” the clips I’ll use to create the Amateur Radio Extra video for Section 3.5. Here’s the result of importing an entire folder. VERY IMPORTANT: If you later add a file to the project file (say, an additional video clip), it will NOT be automatically imported into PDR. The term “import” means just that: you can import a single file or every file in a directory. But, after the import, if you add files, you must then import those new files to add them to the library. Now name the project! This would be a really good time to do your first save. In this case, select File > Save As so that you can give the project a name. NOTE that you will need to specify the path carefully so that your project file ends up in the same directory as the rest of your project files. PDR doesn’t automatically save the file in the same place as your input or output files. Also, if you’ve been working on another project, and you start a new project, PDR will want to put the file in the same folder as your last project, so you will have to tell it otherwise. ALSO, there are certain things you can accidentally do that can cause PDR to change where it stores the project file, so periodically check up at the top of the screen that the file is really going where you want it to! NOTE: Do NOT move project files (PDR uses the extension PDS) with the Windows file system. This will terminally confuse PDR. Rather, open the project with PDR, and re-save it into the new location. NOTE the PDS file does NOT contain all the clips. It merely contains instructions to PDR regarding how to deal with your clips. So you must make sure you back up your clips as well as the PDS files. The next step is to drag your clips to the timeline and begin editing. I’ll cover that in a future post. Good luck!